All 125 Teachers of the Year from the Cobb and Marietta school districts received rock-star treatment Tuesday at the Give Our Schools a Hand pep rally. 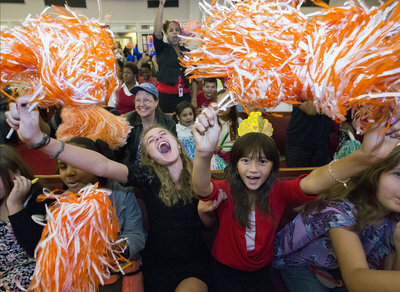 Blackwell Elementary School fifth-graders Alexandra Pepper and Samantha Norman scream and shake their pom-poms in support of their school’s Teacher of the Year Laurie Henderlong on Tuesday during the annual Cobb Chamber Salute to Teachers of the Year event at the Roswell Street Baptist Church. The Cobb Chamber event is in its 26th year. More than 1,250 students and teachers filled the seats at Roswell Street Baptist Church. Students held up signs, pom-poms and noisemakers and screamed as their teachers’ names were called and were presented with plaques from Ragsdale and Marietta Superintendent Emily Lembeck. Some schools even made T-shirts with their teacher’s name on them. Before the pep rally, the teachers were honored at a breakfast. “It’s very humbling and overwhelming,” said special education teacher Mary Bowen, the Teacher of the Year for Davis Elementary School. Chris Whiting, Teacher of the Year for Simpson Middle School, has taught for 17 years. 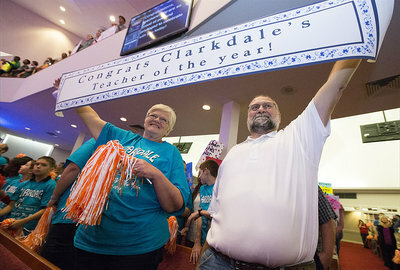 Jackie and Jim Southerland show their support for their daughter, Clarksdale Elementary School Teacher of the Year Sandra Moss. Lost Mountain Middle School’s Teacher of the Year, Linda Guillory, has taught in Cobb schools for 15 years. “It’s quite an honor to be celebrated this way,” said Guillory, who teaches eighth-grade science. Randy Brooks, the Teacher of the Year for Osborne High School, is in his 10th year teaching and his fourth with Cobb schools. Students from Tapp Middle School donned orange and black striped ties in support of their teacher of the year, sixth grade science teacher Alexander Shannon. Twelve-year-old Jaylen Dickey, a seventh grader at Tapp, said he didn’t take Shannon’s class but has worked with him in the school’s leadership program. Still Elementary School Teacher of the Year Wanda Rademacher reaches over during the parade of teachers Tuesday to hug two of her former students, and current Lovinggood Middle School sixth-graders, Alyssa Hett and Erin Seagraves. “He doesn’t let you quit,” Dickey said of Shannon. “She’s really fun to work with and she’s always excited about teaching us,” said Berman, 12. Walton High School students emphatically chanted social studies teacher Matthew Staruch’s name. Sixteen-year-old Walton junior Yasmine Bassil said Staruch is passionate about teaching. Cobb School District Teacher of the Year Tyler Gwynn and Marietta Teacher of the Year Katy Eason were honored for the second time this month. Gwynn and Eason got their handprints placed on Marietta Square earlier this month. Gwynn is a psychology teacher at Allatoona High School, and Eason teaches fifth grade at Sawyer Road Elementary. “It’s surreal, the love and support and this recognition of so many people,” Eason said. Ed Voyles Automotive gave Eason and Gwynn one-year leases on brand-new cars through a drawing. Eason picked a Chrysler Jeep, and Gwynn picked a Hyundai. Also receiving car leases were Daniell Middle School social studies teacher Rick Parker, Cobb’s Middle School Teacher of the Year, and Hendricks Elementary teacher Beth Knight, Cobb’s Elementary School Teacher of the Year. Parker received a Honda and Knight picked a Kia. “We’re like Oprah up in here,” quipped Amy Selby, chamber spokeswoman. U.S. Senator Johnny Isakson spoke for several minutes about the teachers who inspired him growing up and encouraged the students to continue supporting their teachers.